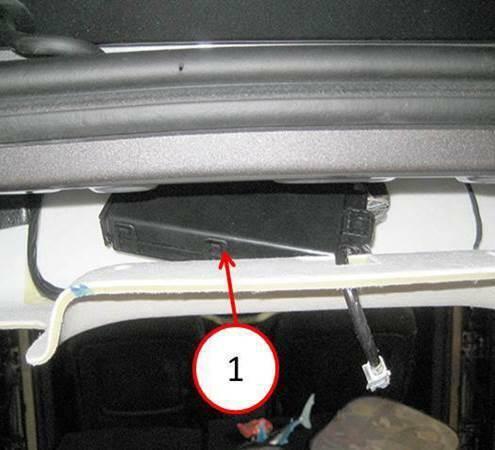 This bulletin involves the replacement of the GPS antenna with a roof mount antenna to improve navigation performance. The customer may experience off route conditions due to weak navigation satellite signal. If the customer describes the symptom/condition listed above, perform the Repair Procedure. 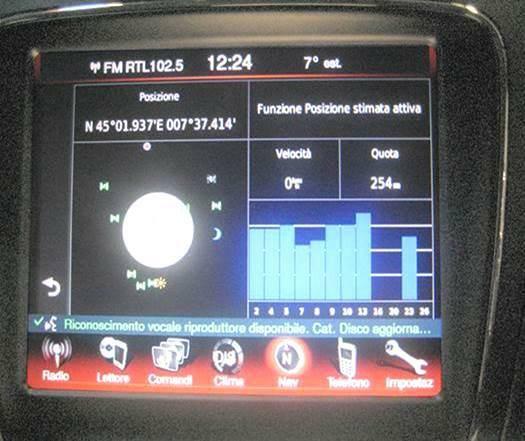 Check the radio software version. Put the radio into dealer mode by pressing the drivers Temp up and down buttons and the front defrost button all at the same time until the dealer mode screen is displayed. 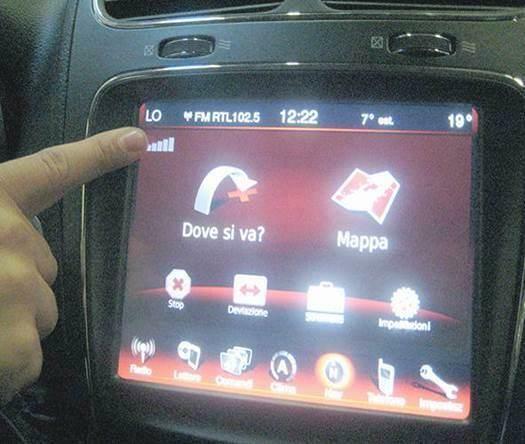 Press the “Navigation” button to read the Nav software version number and the “Radio Part Info” button to read the Head Unit software version number. 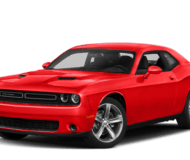 For 2011 Model Year vehicles, is the Head Unit software version the 13/48/18 or newer and the Nav software version the 3.20 or newer? Yes>>> The Radio is already up to date. Proceed to Step #6. No>>> The Radio software has to be updated. 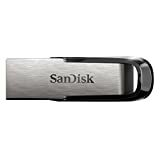 Refer to TSB 08-034-14 to update the unit. Proceed after the update to Step #6. For 2012 Model Year vehicles, is the Head Unit software version the 13/48/46 or newer and the Nav software version the 4.14 or newer? For 2013 Model Year vehicles, is the Head Unit software version the 15/26/63 or newer and the Nav software version the 4.30 or newer? No>>> The Radio software has to be updated. 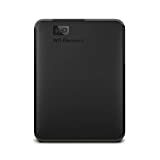 Refer to TSBs 08-033-15 REV. Band 08-032-15 REV. A to update the unit. Proceed after the update to Step #6. For 2014 Model Year vehicles, is the Head Unit software version the 15/09/D1 or newer and the Nav software version the 6.22 or newer? No>>> The Radio software has to be updated. 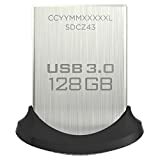 Refer to TSBs 08-033-15 REV B or CSN-R65 to update the unit. Proceed after the update to Step #6. 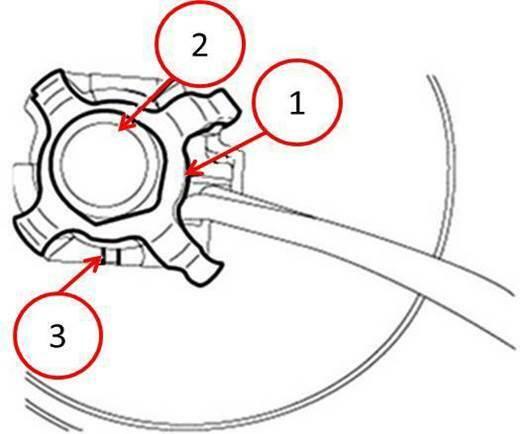 NOTE: To complete the repair procedure it is necessary to get the parts shown in (Fig. 1) ordering the P/Ns 05091031AA, 68068349AA and 68248758AA. (Fig. 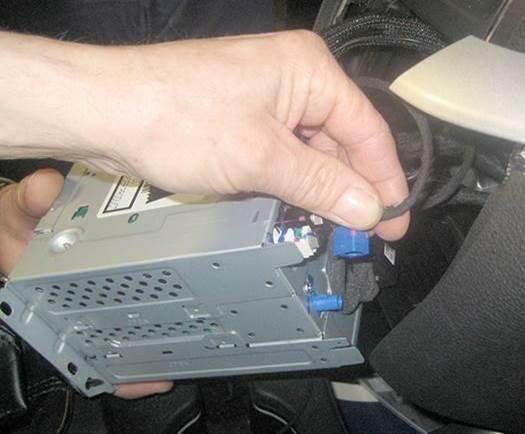 1) shows the routing overview of the body and under-dashboard wiring and the connector connections. Turn the ignition key to the OFF position and disconnect the battery negative terminal. 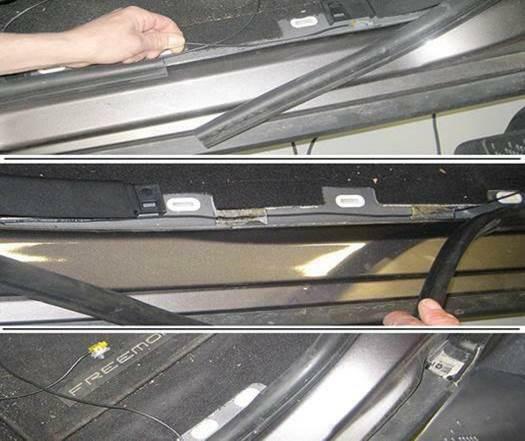 Remove the rear crossmember trim panel by slightly pulling the trim to release the retaining devices. 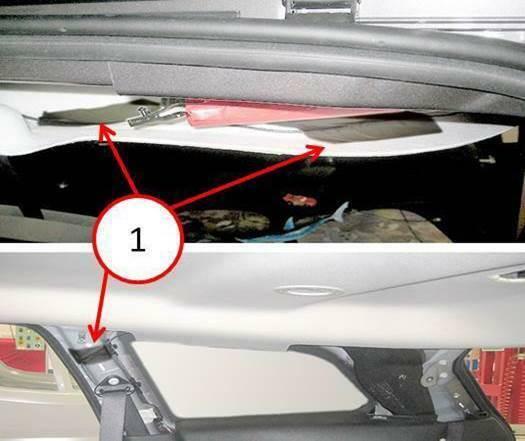 Using the suitable tool, release the rear roof light and move it to one side without disconnecting it (Fig. 3). Remove the upper trims of right and left C pillars (Fig. 4). Remove the upper trims of right and left B pillars (Fig. 4). 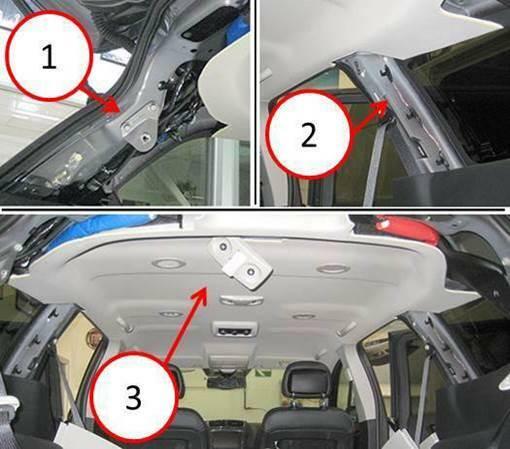 Lower the headliner until the lower part of the antenna can be accessed (Fig. 4). Disconnect the antenna connector (Fig. 5). Remove two nuts and lower the Radio Frequency (RF) module downward (Fig. 6). Slightly press on the back of the trim and remove the nut and the retainer from the old antenna. 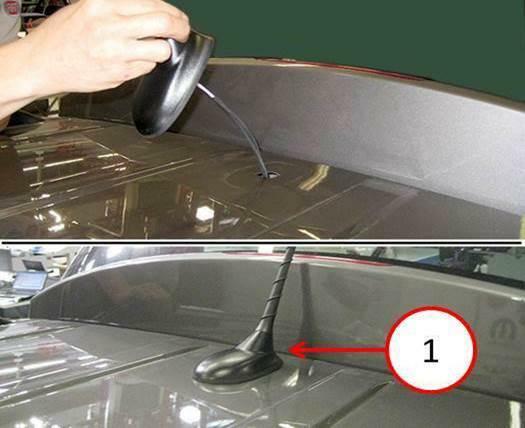 Working from inside the vehicle, press one of the retaining tabs on the antenna using a flat-bladed tool. Press one side of the antenna connector through the roof, then press the other side of the connector and remove the antenna (Fig. 7). Carefully clean the surface of the roof in the area where the new antenna is to be placed. 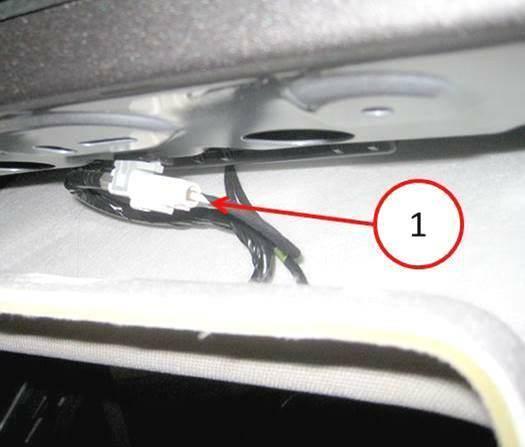 Install the dual function antenna P/N 05091031AA, with two electrical connectors through the hole on the roof. Press antenna into position until the retainer snaps-fit (Fig. 8). Install the antenna retainer and nut. Tighten nut to 90 N·m (66 ft. lbs.). Connect the white connector from the antennae to the white connector from the radio cable (Fig. 9). 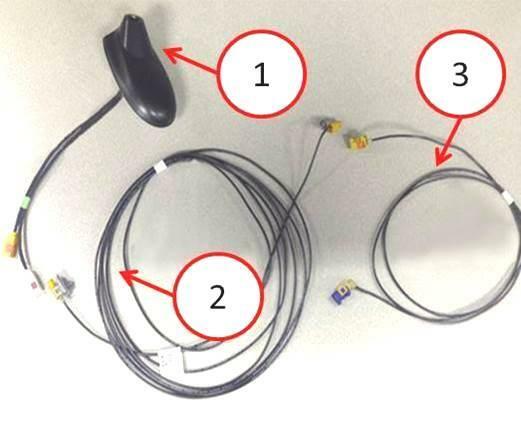 Connect the yellow connector from the antenna to the yellow connector from the body wiring harness from the kit (Fig. 9). Fasten the connectors (white - white) and (yellow - yellow) into the fasteners (Fig. 9) on the roof crossmember. Install the (RF) module with two nuts. 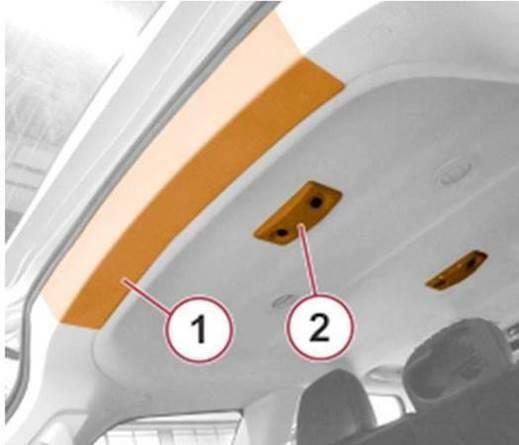 Install the body wiring to the interior side of the roof trim, working from the back side to the right B pillar and secure it with the adhesive tape (Fig. 10). 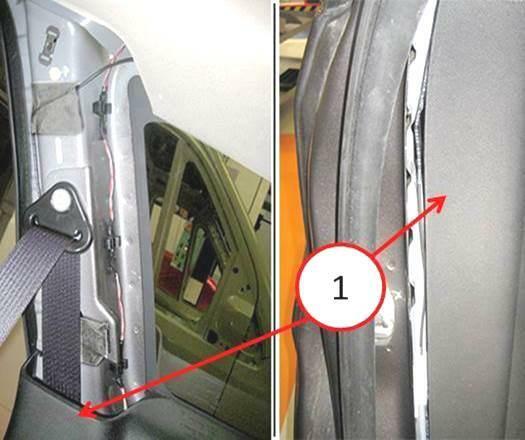 Remove the door weather strip and lay the body wiring along the right B pillar. Secure by applying tape above and below the seat belt attaching point (Fig. 11). Continue by routing the body wiring under the B pillar lower trim (Fig. 11). 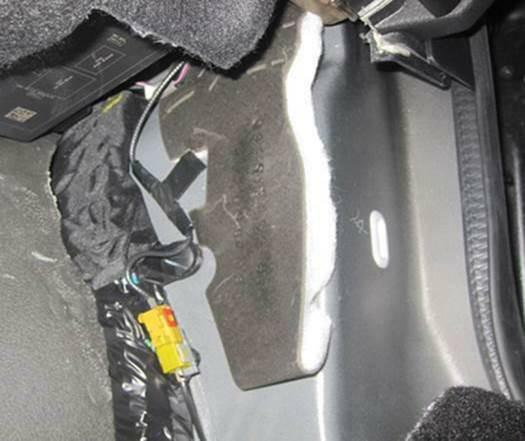 Remove the kickplate from the right rear door compartment. Remove the kickplate from the right front door compartment. Remove the kickplate coupling for the front door. 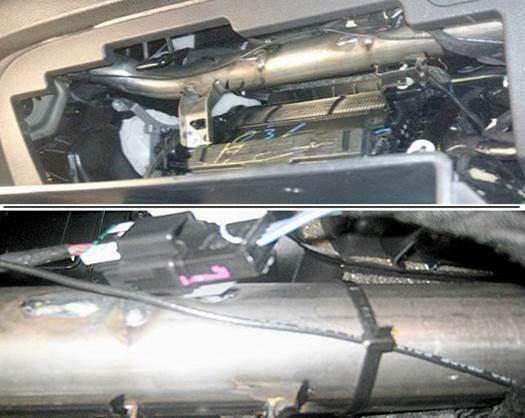 Install the body wiring along the right lower side of the vehicle until reaching the passenger feet area, under the pillar lower trim and secure it to the sill with adhesive tape (Fig. 12). 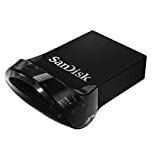 Disconnect the GPS connector and wrap with insulating tape. Also wrap harness wires to lock in place and prevent noise (Fig. 13). Open the glove box, release it from the retainers and flip it downward as shown in (Fig. 14). 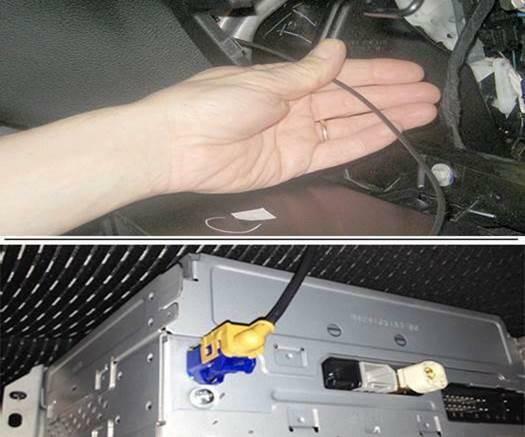 Using the under dashboard wiring from the kit, install the yellow/blue connector from the area behind the glove box, until it protrudes out from the radio housing as shown in (Fig. 15). Connect the yellow/blue connector to the radio. 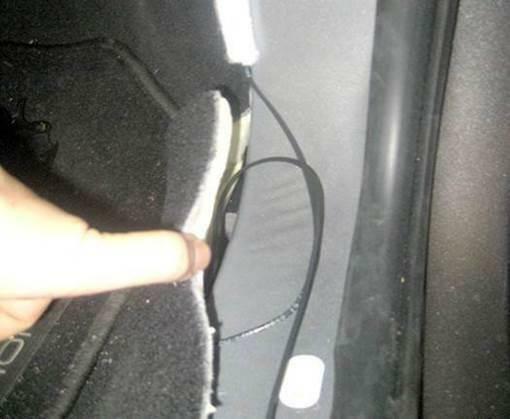 Secure the wiring under the dashboard to the dashboard crossmember using cable ties (Fig. 16). 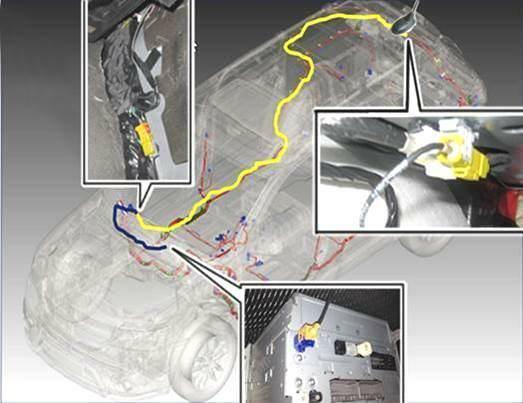 Route the wiring out from under the dashboard (Fig. 17) on the lower right side of the dashboard. Connect the yellow connector for the body wiring (coming from the back) to the yellow connector of the under dashboard wiring, coming from the radio (Fig. 17). 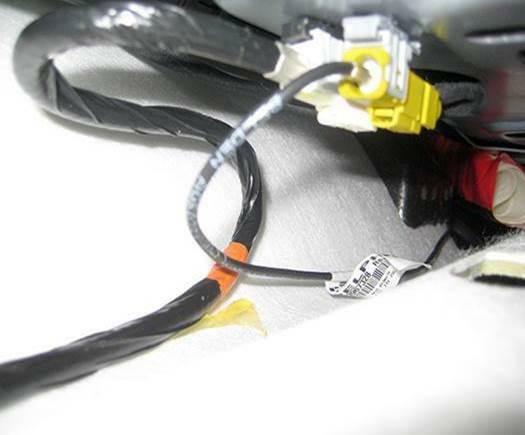 Fasten the connector coupling to the A pillar and secure the wiring under the dashboard and the body wiring with adhesive tape (Fig. 18). 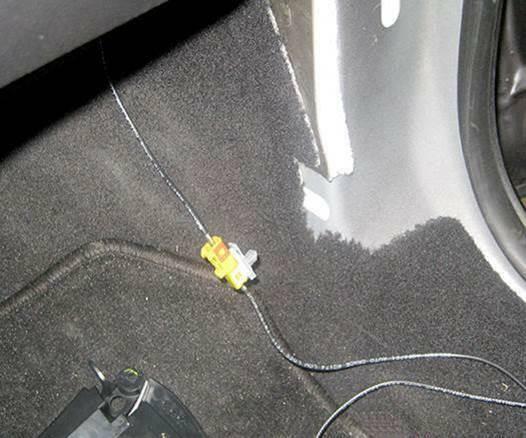 Place any remaining wiring under carpet as shown in (Fig. 19). 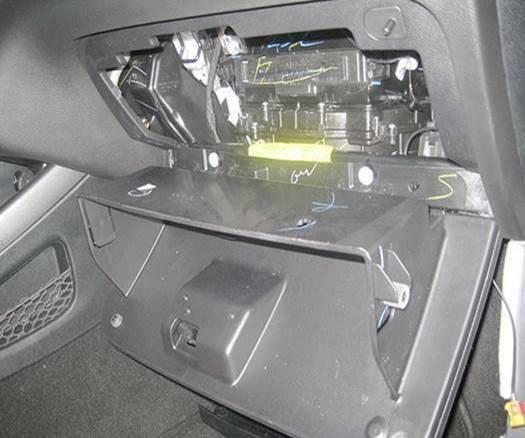 Install any previously disassembled or removed components (glove box, radio, kickplates and mouldings, etc.). Move the vehicle outdoors to a place free from high obstacles to check radio operation. From the home page of the ‘Navigation Menu’, touch the upper left upper corner signal strength icon (Fig. 20). Check the number of receiving satellites and the intensity of the signal from each satellite (indicated through bars) verifying a good GPS signal is shown in (Fig. 21). 08-20-04-94 Install Dual Function Antenna and Overlay Harness (2- Skilled) 6 - ELECTRICAL AND BODY SYSTEMS 1.6 Hrs. 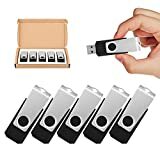 Please Notice That the Black 32GB USB Flash Drives are ONLY PACK OF 5!